The Country Scrapper: Oh Happy Day! This morning was absolutely beautiful! My snow melted, it was partly cloudy, and warm! 60 degrees! Well I got a bit of Spring fever and headed for my little barn to snap a few pictures, because I knew an ice storm was coming this way for tonight. So here's a picture of our newest addition. Her name is Suzie Q. We got her from the animal shelter, they said when her litter came in they were in bad shape and covered in fleas. Now she's just a little bundle of joy. She's not sure what to make of the chickens yet. I think the chickens are trying to babysit Suzie Q. They don't let her out of their site. This chicken we call "Old Black Headed Chicken" because in case you didn't notice her head is black. We laugh because she's never hatched baby chicks or even tried to sit on a nest of eggs. Her favorite pastime is sneaking thru the little cat door on the side of the barn and eating cat food! She's not worth a dime but we love her dearly! 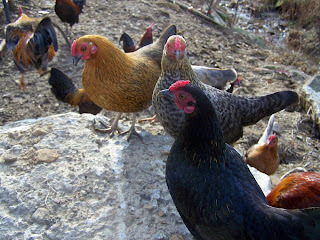 Here is a picture of the hens taking it easy on this nice warm morning. And this is Smoky, my little horse Matt got me for Easter in 2006. I've always wanted a horse and about fell over when he brought Smoky to me. I'm pretty sure he will NEVER be able to top that gift! Smoky's a little fuzzy right now because he has his winter coat. I think he has Tina Turner hair! Now wouldn't it be nice if I posted something scrappy! I've moved on to Valentine's Day already! That didn't take long, did it? 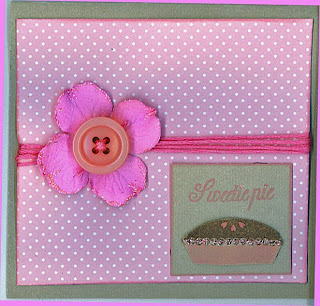 This little card was made with Colorbok paper and my Papertrey Ink Stamps (that I love). I used a Prima flower and some Stickles. It says "Sweetie Pie". Now on to a bigger project. I had thought about making a little Christmas tree with a Styrofoam cone, but decided to make a Valentine's Day tree instead! First I covered the foam with pink felt then used my Cricut to cut out a bunch of pink hearts (I only used scrap paper I had in my stash). I covered the tree with bigger hearts and then stuck the smaller hearts all over it so they'd stand out. I used stick pins to attach small Prima flowers and added some buttons. The topper is just a simple bow with some Michaels ribbon. It is so cute sitting on my desk! Hope you enjoy my little glimpse of Spring! Hey Amber! Love seeing all the photos of your animals. SusieQ is quite the adorable little princess. 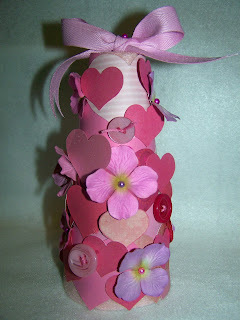 And what cute Valentine's projects. Love the card and the styrofoam tree is a fabulous idea. I've seen plenty of Christmas trees from those cones, but hadn't ever thought of a Valentine's tree before. Great idea! 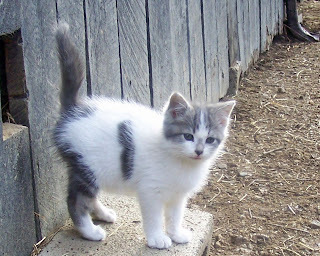 Oh my gosh, your kitty is soooooo adorable, I bet she is having a ball exploring your farm! 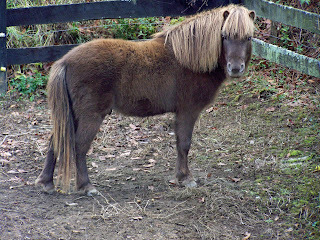 Your chickens are so cute and your pony is so precious! 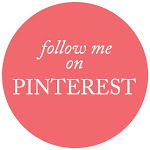 Thanks for sharing photos of your animals. 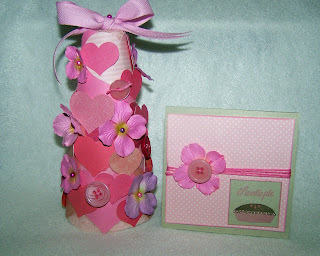 I love your Valentine's Day tree and card, the tree is awesome, what a great idea! Suzy-Q is so cute and I love her color. I can see how it's so easy for you to love them. What would a barn be without a cat?? 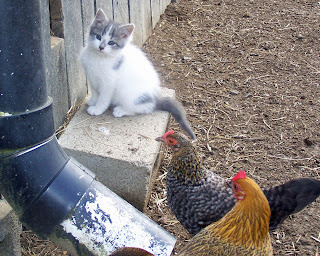 The chickens are curious about this new little addition. 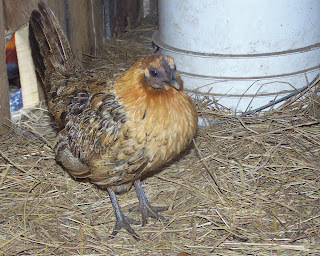 You and Matt put alot of thought into naming Old Black Headed Chicken..hehehe..her head is black, as far as her and nesting, maybe she thinks she is a cat!!! You definitely described Smokie's hair right. And last of all, love the card and your tree turned out great. Isn't creating wonderful??? I love it. What a cool little group of animals you have! I'm so jealous of your 60, it's -10 here. Love the tree card combo! !